LCCC ranked in the top 10! 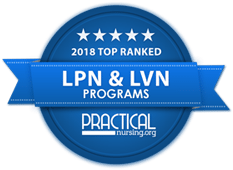 Lorain County Community College’s LPN program has been ranked in the top ten of the best programs in Ohio by Practicalnursing.org. LCCC’s program came in at #9. Visit PracticalNursing.org’s website for more information. Nursing programs were assessed on several factors which represent how well a program supports students towards licensure and beyond. We analyzed past and present first time NCLEX-PN “pass-rates” – weighted by year. You can learn more about the methodology used. Licensed practical nurses (LPNs) care for the sick, injured, convalescent and disabled under the direction of licensed physicians, dentists, podiatrists, optometrists or registered nurses. They work directly with patients to provide care such as taking vital signs, administering medications (where state law allows), applying dressings, collecting blood and fluid samples for laboratory testing, observing and recording the impact of treatments, and providing physical and emotional support. After successfully completing this program, you will receive a certificate of completion in practical nursing and must pass a national examination (NCLEX) to be an LPN (licensed practical nurse). As an LPN, you may work in a hospital, nursing home, assisted living center, hospice facility, private residence or other long-term care center. While you will work under the direction of a registered nurse or physician, you function independently in situations where the client’s condition is stable and non-acute. Experienced LPNs may supervise nursing assistants and aides. As a licensed practical nurse, you are eligible for advanced placement in LCCC’s associate of applied science in nursing program.